But his story was destined to be far more tragic. There are corners of the Eanigmus that still remain uncharted to this day, and perhaps more doorways lay in hiding, waiting eagerly, hungering to open, but it was Excereax that was discovered, quite by accident, by Quintax and his group of explorers and magicians during a particularly cold autumn. “Quintax!” shouted the youth, a yellow haired boy of seventeen, running toward the group with laboring breath and wild, wide eyes, filled with equal parts excitement and fear. Quintax’s eyes flickered and his concerns about the youth’s exhaustion melted away immediately. Harris’s response was not swift enough for Quintax, who placed his hands on the boy’s shoulders and jerked him upright, their eyes locked with burning intensity. Now, away from the door, the feelings and emotions that had washed over him started to fade, and he began to second guess himself. But when he was there, at the threshold, he was never more certain. The door had spoken to him, had it not? Seductively, coaxing him closer, willing him to dash his fists against the rocks that sealed the secrets and wonders, until his flesh split and his bones shattered and his bloody stumps found the door hidden beneath. But he was also afraid; an irrational fear of the cyclopean archway, of the voice that whispered of the glorious sights beyond, that had caused him to take a nervous step back and then another. And then, despite his fervent and uncontrollable desire to behold what waits inside, he ran. Jerold Quintax finally released the youth, who sank to the dirt below, and he smiled. How long had they heard legends of other doorways, of other worlds to explore? So far they had found only one, a door leading to the Terrafirmoux, a world known to its native inhabitants as Earth. But that world had gone the way of science, had in fact nearly destroyed itself with technology, and so dealings with them had been banned and forbidden, effectively sealing it off from inquiring minds. But Quintax was an explorer at heart, and so as vast and diverse as it was, he longed for something more than what the Eanigmus held. He longed for divinity. The men and women behind him, a group of twenty explorers and magicians, waited in silence. Quintax remained facing away from the group, in meditation, fighting the urge to run toward the doorway that was calling out to him even now. As he tilted his head toward the sky, eyes shut, the chill in the air reddening his cheeks, he felt a snowflake land on his forehead—the first of the year, not unheard of so early—and then another just above his mouth, which he gleefully licked from his lips while taking in a deep breath. When he opened his eyes once more the sky was white, threatening to unleash a blizzard upon the mountainside next to which the magicians now stood. “Quintax, the snow,” said Erik, a man whose healing abilities were unmatched among the group. “Enough,” Quintax said, turning to address his followers. He was young then, black hair not yet white, clean shaven, angled features of a handsome man, wearing crimson robes that billowed in the increasing gusts of wind screaming down off the mountain. And they did scream here. The echo of the wind, a woman’s scream, sent a shudder through the group of magicians, all but Jerold Quintax. He hardly noticed anything other than the humming seduction of the doorway. There were objections of course, but no one vocalized them and no protests were enacted, and as they drew nearer the door, the remainder of the group started to feel the same tug that Quintax had felt the moment he gained knowledge of its existence. No persuasion was needed by their leader any longer. The doorway was doing that job for him, tethering and pulling them toward its gaping maw. The storm did not wait. It spewed forth its payload as soon as they set off, so that by the time they were within a mile of the archway, they were already trudging through several inches of snow. This slowed their progress of course, but by now the proximity of the door countered any affect the storm may have had on their rising mania. Though they had brought proper attire for potential of such weather, and supplies to set up camp should they need shelter and none was to be found, they forsook comfort and rest to expedite their travels. “It’s God,” said a man named Wick. “What are you on about now?” asked Alicia. But she had been feeling the same thing. They all were, as utterly incredulous a thought as that was; God, living behind a rock in the middle of nowhere. Whatever it was that waited for them behind the door, God, friend, or enemy, it had its hooks in them, and they were thankful for it. Jerold Quintax was oblivious to the trivial banter of those behind him, even of their very presence. He strode off ahead of the group, determined to be the first to stand before the gates and gaze into the domain of his creator. That’s what he believed he had discovered. Yet, it was Harris who had first found the gate, was it not? History would not remember this however. Quintax would make sure of that. Harris would not survive this pilgrimage to tell such tales. The invasion of such thoughts was jarring at first, frightening even, and for the first time since learning of the door, Quintax harbored doubts. But there was no stopping the grinding gears that had been set in motion, and before he could turn to look at the youth, to tell him with his eyes that he was sorry, that he would never harm any of them, the storm cleared enough for them to view the doorway for the first time, and any lingering doubts vanished along with their innocence. 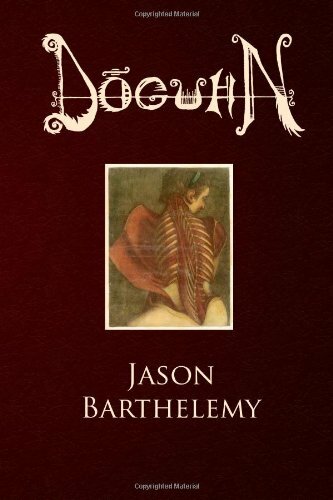 This entry was posted on Saturday, June 23rd, 2018 at 12:12 PM	and tagged with books, doguhn, Fantasy, horror, jason barthelemy, novel, reading, sequel, the living dread, writing and posted in Dreaditorials, Writing Samples. You can follow any responses to this entry through the RSS 2.0 feed.